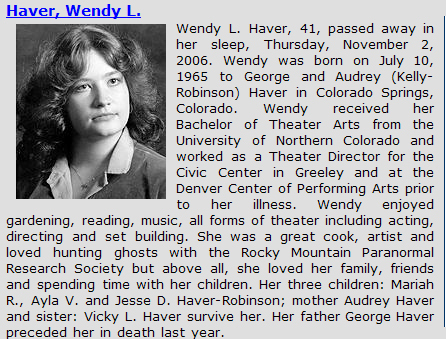 Wendy was one of our founding members and she will be missed. She was a great help to the group and a very kind spirit. Wendy. What a lovely name! Bright and sparkling. I once had a friend named Wendy, a warm, compassionate woman who had the ability to transform simple words into a great big honest-to-goodness bear hug. To me she was--as the name implies—light as air. I met Wendy online. I was researching a ghost story and decided to write to a local paranormal research organization. I saw Wendy’s name and, deep inside, I knew she was the one I needed to contact. We shared a love of ghost stories and a desire to explore the unknown. From those first words she sent to me, I knew we would be friends, and I wanted to be her friend. It didn’t just “happen.” Wendy was the type of person that you wanted to have in your life. She sent me pictures of her children—she was so proud of them!--and every one of her messages had at least one story about her lovely daughter, Mariah, the adorable Ayla, and her handsome son, Jesse. Sure, she had struggles, and this was a source of bonding for us, as well, but her struggles never stopped her from being there for me and others. Every word, sentence, paragraph that she wrote to me bubbled over with life and love. I was feeling so lost when I met her, so threatened by everything around me, but her words to me were always comforting, like a soft blanket, and they seemed to simply appear in my mailbox when I needed them most. Then suddenly, Wendy stopped writing back. I was stunned. I went over and over my messages, trying to figure out what I might have said to offend her. One day, months later, there was an email in my mailbox. It was Wendy, apologizing, and asking if all was good in my world. At the end of her message she carefully explained why I had not heard from her. Wendy was very sick, and as much as I wanted to reach out and help her, to take away her pain, this was something she would have to go through on her own. I wrote back, desperate to offer the same kindness and comfort that she had, without hesitation, offered to me, but I received no reply. For months, I heard nothing. Then another email, a group email sent to many of her friends explaining that she was too sick to check for messages and her email provider had deleted most of her mailbox. I didn’t know what to do. I didn’t want to tell her how frightened I was to lose such a dear friend because this was not about me, and I didn’t want to burden her with yet another email that would be all too painful to read. She had so much to think about, so much to take care of. But I wanted to give her hope, because I still had hope. I still prayed that she would recover and all would be as it was before for Wendy and her children who were so deeply, so compassionately loved. I tried to explain this in a message, but I was never as eloquent as she was with words of comfort and support. Last May, Wendy contacted me for the last time. She apologized for not keeping up with her email, explaining that she spent most of her time in bed and was in too much pain to type. She told me her doctors had tried chemo, radiation, even a bone marrow transplant. She told me that a cure was no longer an option and when I read those words, it was as if someone had plunged a dagger into my heart. Her last words to me were “Please, write back and let me know how you are doing.” Always concerned about others first. I kept writing, hoping, praying that against all odds, my friend, Wendy, would recover, but I heard nothing. I sent more and more messages. Then, two weeks ago, I happened to come across her obituary. I sent her one last message to tell her how deeply I care for her, to tell her I now understand. I understand that life is the glass half full. Before I met her, I would have said that she only lived to be 41, but she would say that she was blessed with 41 years of precious moments. Because the truth is that we are born with an inhale and die with an exhale, and each breath in between is precious. I contacted Wendy to speak of the dead, and instead, she spoke to me of life as if it was priceless, something to be cherished. I still have a friend named Wendy. I have carried her warmth of spirit with me, since those first words she sent my way. Wendy always signed her emails to me “with love and light,” and oh, what a wonderful image to leave behind. What a wonderful thought to ponder in troubled times: love and light and Wendy. P.S. I finished this essay this morning and curled into a ball on my bed, sobbing, mourning the loss of a friend. Then suddenly, I started to feel lighter. Physically lighter. Something inside of me told me that I needed to spend time with my granddaughter. I decided to email the essay to myself so I could post it to my blogs from my daughter’s house. When I finished, I returned to my mailbox to make sure the message went through. I was shocked to discover that just below the message I sent, the one with the subject that read “WENDY,” was a message that had arrived at the exact same moment from…WENDY! My sister-in-law, a beautiful, young woman who welcomed me into this family with such warmth and compassion, is also named Wendy. My sister-in-law sent me a message with pictures of her brand new baby, Logan, at the exact moment I was posting an email with an essay on the death of my friend. At five in the morning. There are no coincidences.